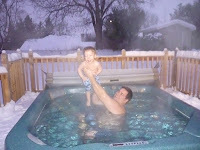 Some people may find Michigan winters a bit cold, but it's not so bad if you can relax and get warm in a hot tub! Chris and Cam had a fun time during the week taking a dip. Cameron loves to splash in the water and kick his legs. Since the hot tub is definitely much bigger than his bathtub, it's quite a treat. One of his favorite hot tub activities is having Chris whisk him up in the air and then quickly back into the toasty water. 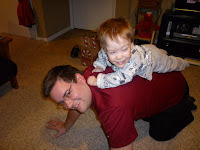 Playtime with Jane and piggybacks with Chris were a big part of Cam's week. Cameron's now working on choosing pictures that represent his toys so that he's deciding what to play with. Chris and Jane finally stopped taking pictures when they hit the fifty mark! They had no idea that Cameron had soooo many toys. One of Cam's daily activities is practicing his walking with his cool leg braces on. Chris is so creative when it comes to making this always interesting for Cam. Shown here is a box tower that Cameron pushed from one end of the basement to the other. Amazingly enough, it didn't even fall! The big boy is getting stronger every day! !